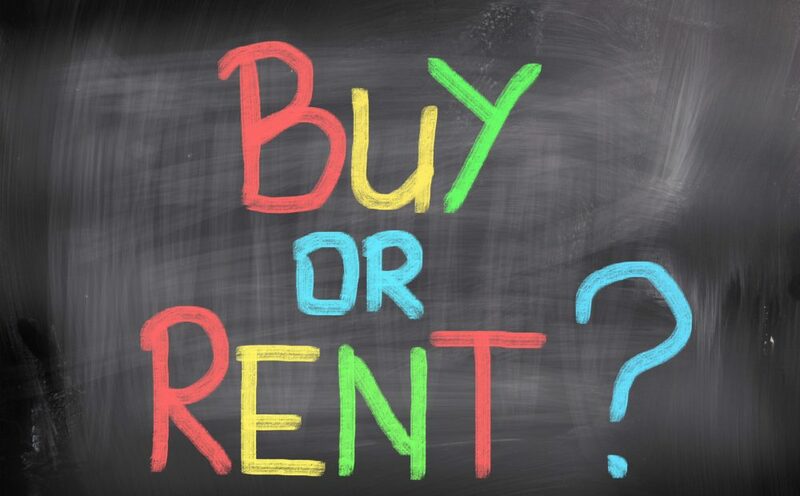 A recent survey amongst UK estate agency members aimed to find out which is the cheapest option when looking for a home: buying or renting. Conducted by Relocation Agent Network, of which Moss Properties is a member, the survey found that buying a house continues to be the cheaper option. 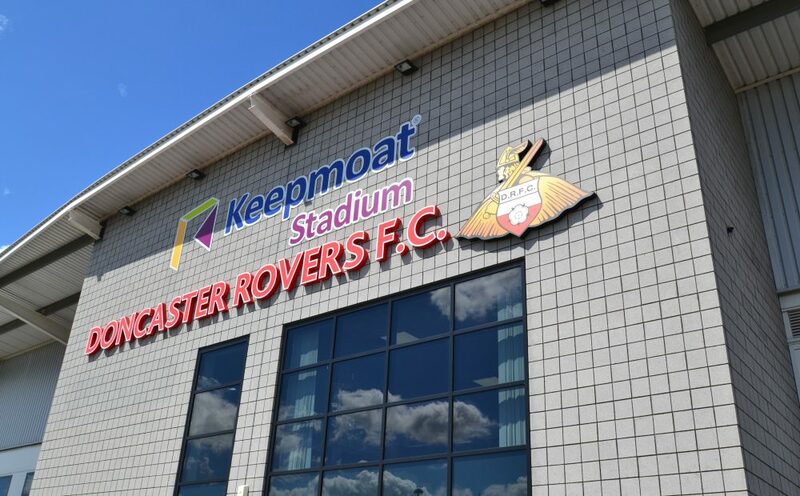 Over the last month, the Doncaster property market has seen some interesting movement in house prices, as property values in the Doncaster Metropolitan Borough Council area rose by 0.9% in the last month, to leave annual price growth at 2.8%. These don’t compare as well to the national figures, where property prices across the UK saw a monthly uplift of 0.42%, leaving the annual property values across the country 8.3% higher. This might be down to the constraining factors of Stamp Duty changes in the spring and more recently our friend Brexit, however, it does mean there might be some bargains out there for landlords and homebuyers alike. Looking at the figures for the last 18 months makes even more fascinating reading, whereby house prices are 8% higher, again thought provoking when compared to the national average figure of 13.6% higher. However, it gets more remarkable when we look at how the different sectors of the Doncaster market are performing. 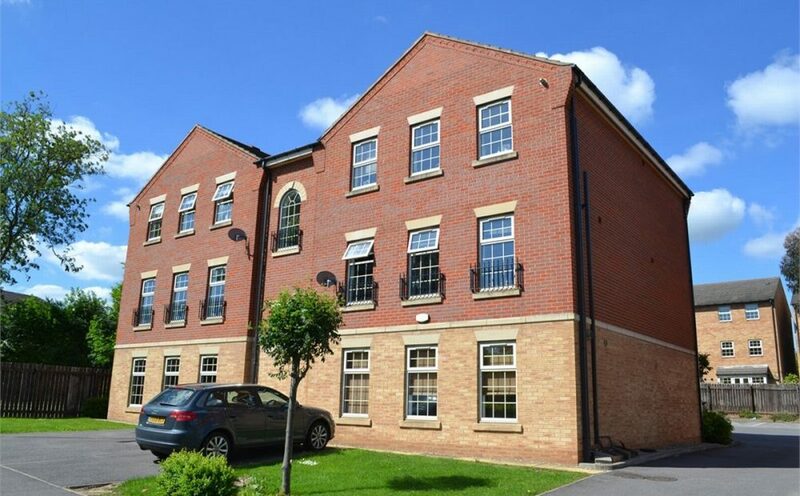 Over the last 18 months, in the Doncaster Metropolitan Borough Council area, the best performing type of property was the semi, which outperformed the area average by 0.2% whilst the worst performing type was the apartment, which under-performed the area average by 1.62%. Now the difference doesn’t sound that much, but remember two things, this is only over eighteen months and the gap of 1.82% (the difference between the semi at +0.2% and apartments at -1.62%) converts into a few thousand pounds disparity, when you consider the average price paid for a semi-detached property in Doncaster itself over the last 12 months was £119,300 and the average price paid for a Doncaster apartment was £94,700 over the same time frame. So what does all this mean to Doncaster homeowners and Doncaster landlords and what does the future hold? 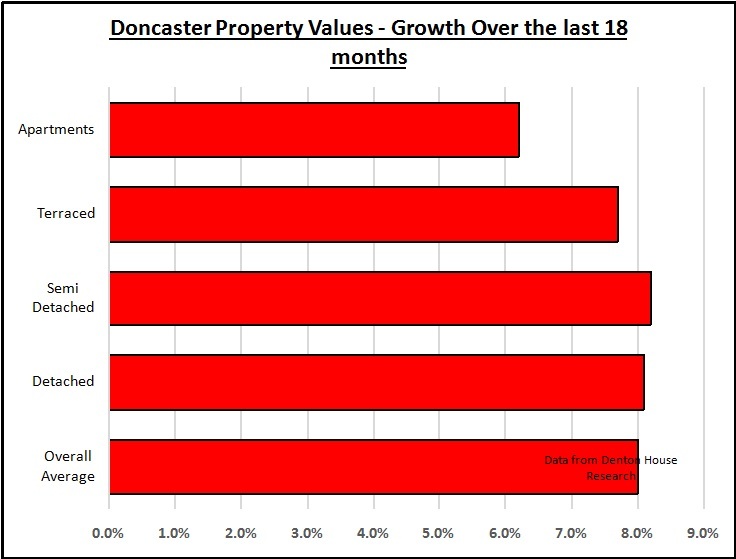 When I looked at the month-by-month figures for the area, you can quite clearly see there is a slight tempering of the Doncaster property market over these last few months. I have mentioned in previous articles that the number of properties on the market in Doncaster has increased this summer, something that hasn’t happened since 2008. Greater choice for buyers means, using simple supply and demand economics, that top prices won’t be achieved on every Doncaster property. You see, some of that growth in Doncaster property values throughout early 2016 may have come about because of a surge in house purchase activity, an indirect result of the increase in stamp duty on second homes from April, thus providing a temporary boost to prices. However, it may be possible the recent pattern of robust employment growth, growing real earnings and low borrowing costs will tilt the demand/supply seesaw in favour of sellers and exert upward pressure on prices once again in the quarters ahead. …And Doncaster property values, assuming that everything goes well with Brexit, I believe in twelve months’ time we should see values in the order of 1% to 2% higher. 9,100 People Live In Every Square Mile Of Doncaster – Is Doncaster Over Crowded? Doncaster is already in the clutches of a population crisis that has now started to affect the quality of life of those living in Doncaster. There are simply not enough homes in Doncaster to house the greater number of people wanting to live in the town. The burden on public services is almost at breaking point with many parents unable to send their child to their first choice of primary or secondary school and the chances of getting a decent Dentist or GP Doctor Surgery next to nil. 9,100 people live in each square mile of Doncaster, it’s no wonder we appear to be bursting at the seams! In Doncaster, only 13.03 people live in every acre of Doncaster … not as headline grabbing, but a lot closer to home and relative to everyday life, and if I am being honest, a figure that doesn’t seem that bad. As a country, we have plenty of space to build more homes for the younger generation and the five million more homes needed in the next 20 years would use only 0.25% of the country’s land. Now I am not advocating building massive housing estates and 20 storey concrete and glass behemoth apartment blocks next to local beauty spots such as Brodsworth Hall or the nearby Cusworth Hall , but with some clever planning and joined up thinking, we really do need to think outside the box when it comes to how we are going to build and house our children and our children’s children in the coming 50 years in Doncaster. If anyone has their own ideas, I would love to hear from you. What will the 0.25% Interest Rate do to the Doncaster Property Market? The other sector of the economy the Bank is worried about, and an equally important one to the Doncaster economy, is the Financial Services industry. Financial Services in Doncaster employ 1,322 people, making up 2.7% of the Doncaster working population. Together with a cut in interest rates, the Bank also announced an increase in the quantity of money via a new programme of Quantitative Easing to buy £70bn of Government and Private bonds. Now that won’t do much to the Doncaster property market directly, but another measure also included in the recent announcement was £100bn of new funding to banks. This extra £100bn will help the High St banks pass on the base rate cut to people and businesses, meaning the banks will have lots of cheap money to lend for mortgages .. which will have a huge effect on the Doncaster property market (as that £100bn would be enough to buy half a million homes in the UK). It will take until early in the New Year to find out the real direction of the Doncaster property market and the effects of Brexit on the economy as a whole, the subsequent recent interest rate cuts and the availability of cheap mortgages. However, something bigger than Brexit and interest rates is the inherent undersupply of housing (something I have spoken about many times in my blog and the specific affect on Doncaster). The severe undersupply means that Doncaster property prices are likely to increase further in the medium to long term, even if there is a dip in the short term. This only confirms what every homeowner and landlord has known for decades .. investing in property is a long term project and as an investment vehicle, it will continue to outstrip other forms of investment due to the high demand for a roof over people’s heads and the low supply of new properties being built. 87% of Doncaster Properties have 3 or more bedrooms – Problem or Opportunity? The orthodox way of classifying property in the UK is to look at the number of bedrooms rather than its size in square metres (although now we are leaving the EU – I wonder if we can go back to feet and inches?). It seems that homeowners and tenants are happy to pay for more space. It’s quite obvious, the more bedrooms a house or apartment has, the bigger it is likely to be. The reason being not only the actual additional bedroom space, but the properties with more bedrooms tend to have larger / more reception (living) rooms. However, if you think about it, this isn’t so astonishing given that properties with more bedrooms would typically accommodate more people and therefore require larger reception rooms. In today’s Doncaster property market, the Doncaster homeowners and Doncaster landlords I talk to are always asking me which attributes and features are likely to make their property comparatively more attractive and which ones may detract from the price. Over time, buyers’ and tenants’ wants and needs have changed. In Doncaster, location is still the No. 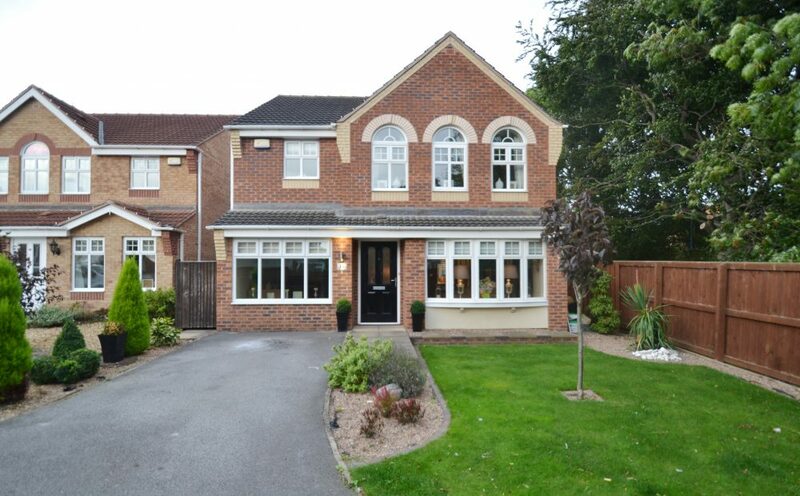 1 factor affecting the value of property, and a property in the best neighbourhoods, say Bessacarr, Old Cantley or Scawthorpe can command a price nearly 50% higher than a similar house in an ‘average’ area. However, after location, the next characteristic that has a significant influence on the desirability, and thus price, of property is the number of bedrooms and the type (i.e. Detached/ Semi/Terraced/Flat). In previous articles, I have analysed the Doncaster housing stock into bedrooms and type of property, but never before now have I cross-referenced type against bedrooms. These figures for the Doncaster Metropolitan Borough Council area make fascinating reading. 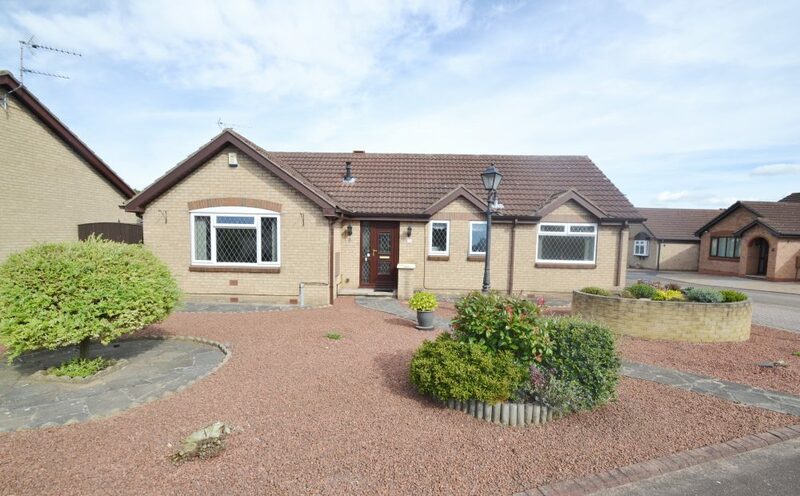 It shows 87% of all properties in the area have 3 or more bedrooms.